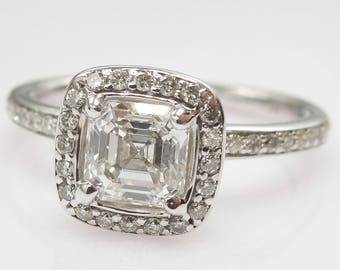 This beautiful diamond ring, one of our very own creations, is made in the Art Deco style of 14K white gold. Fourteen diamonds (0.13ct) adorn the shoulders and go down the shank. 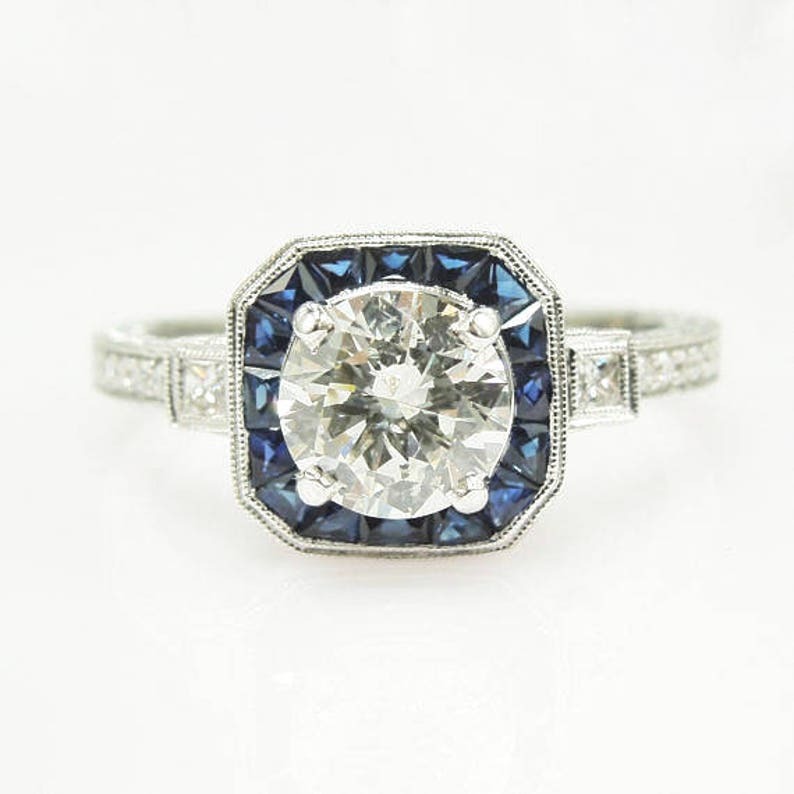 The center stone, a 0.90ct (H-I color, SI clarity) diamond, is prong set and surrounded by a halo of 0.48ct worth of vivid, natural, bright blue French cut sapphires. A wheat engraving finishes the elegant band. 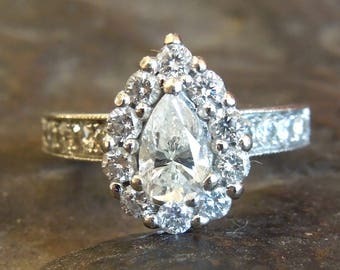 LAB GROWN DIAMONDS: We can source natural and lab grown (synthetic) stones of any variety, including lab grown diamonds. For instance, a half carat lab grown diamond (G color, SI1 clarity) would cost between $1100-1300 as of August 2018. By comparison, a natural stone of the same qualities would cost between $1500-1800. We can source stones of different clarities and colors, but G-SI is a good balance between color, clarity, and cost. 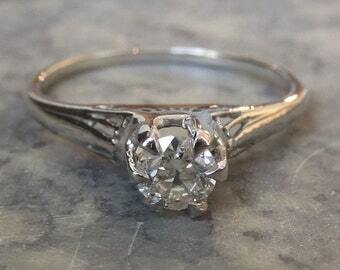 All lab grown diamonds that we sell are certified and laser inscribed, indicating that they are not natural. 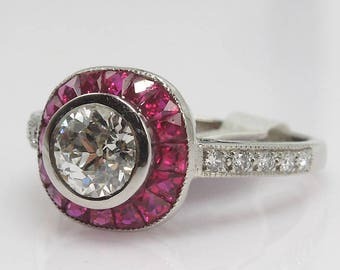 Lab grown diamonds are chemically, visually, and microscopically identical to natural diamonds, the exception being that they are made above the ground rather than below it. Camée magnifique et tout à fait conforme à la description. En revanche très surprise et déçue des frais de douane qui ont couté 120 euros ! C’est assez lamentable et le prix du camée est du coup bien trop cher. We will happily accept your major credit card, debit card, Etsy gift card, your personal check, or PayPal. We offer fee-free deferred gratification (layaway). Within 3 days of reserving your piece, we require 1/3 deposit to hold the item, with sixty days to complete payment. If your layaway isn't satisfied after 60 days, the product will be put back out for sale and your money paid will turn into a store credit, which will expire after one year. For Tennessee residents, Etsy will automatically assess a 9.25% sales tax. SIZING FEE: We offer ring sizings at our cost. 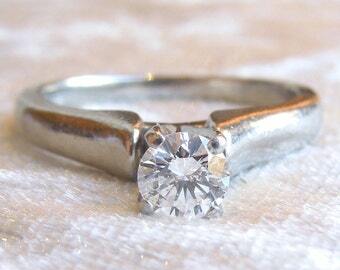 For silver rings, the fee is typically between $20-30. For gold, the price rises to $30-50. Please inquire by messaging us how much your sizing fee will be, should you need your ring sized before it ships. If you are not, first call me (see below) and let's see what the problem is. If it is not something I can take care of, I will issue a refund as soon as the item comes home (less our actual shipping costs). You must issue a return within three days of receiving the item. If your purchase does not arrive, call me and I can begin a trace. We ship Tuesday through Saturday, and orders placed on Sunday and Monday will be sent the next business day. Our standard shipping to Mainland U.S. and Hawaii is free..
On silver items requiring no additional insurance, we ship via USPS with Delivery Confirmation. 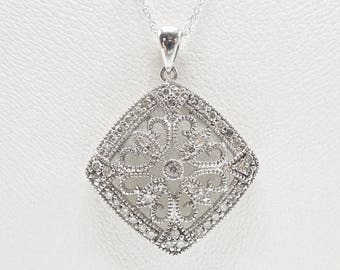 Fine jewelry is sent via insured USPS Priority (2-3 business days). For an additional fee, we can ship via FedEx or UPS Overnight or 2nd Day Air. All of these shipments require an ADULT SIGNATURE upon delivery. We ship all international orders insured via USPS at the going rate and with signature confirmation, insured for the FULL value. Please do not ask us to reduce this amount on customs forms. 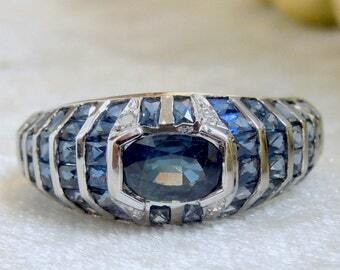 Exact quotes take significant amounts of research (contacting our jeweler, our stone dealer, etc. ), therefore, if you're interested in a custom designed piece, please call us (615-321-4600), as it is much easier to narrow down your actual needs verbally. Please keep in mind that CUSTOM ORDERS involving new design and fabrication typically take 6-8 weeks. Custom orders of designs we make usually take 10-14 days. So, requesting a custom piece for Valentine's Day on February 3rd isn't the best idea. Our pictures show the real items without any special processing. But the color and brightness may differ a little for the difference of shooting facilities, computer display screens or other factors. Your understanding is so appreciated.